Here at St Rose, we’re on a journey as a parish, into intentional discipleship, stewardship and evangelization. We use the words discipleship, stewardship and evangelization often within the Catholic Church; but what do these “churchy” words mean? Discipleship: is our response to Christ’s offer to “Come, follow me”. It is a vocation to holiness and to evangelizing the world as directed by Jesus. Evangelization: is our fundamental mission as disciples to spread the Good News. 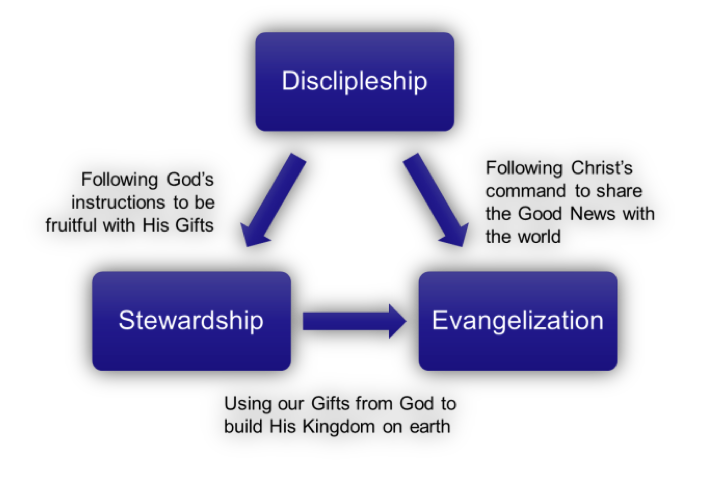 Stewardship: is how we manage all the gifts God has given us as we endeavor to follow Him as disciples and carry out His mission of evangelization. All express actions. They are not passive concepts. They can and should affect how we live our lives. They are related terms that support and build on each other; but Discipleship is at the heart. Once one is a disciple; evangelization and stewardship follow naturally and almost automatically. Despite the active nature of being a disciple, an evangelist and a steward, we can really only understand their significance by first understanding their underlying spirituality. We can understand this spirituality in terms of the following beliefs which compel and enable us to be faithful evangelizing disciples and good stewards. Identity: We are created in the likeness and image of God. We are created by God for God; to love and serve Him. Trust: We are called to carry out His will, not ours. Everything we have comes from God. We can trust in Him because he created us. Love: We are created by God to love Him. Love is a gift that must be given freely. In loving God, we are called to love one another. Our identity is based on a loving relationship with our God. We are created in His likeness, in the image of God. We are created by God for God; to love and serve Him. It’s been said that we are made by love, for love, to love. This love isn’t puppy love. This is self-sacrificing, willing and doing the good of the other, heroic love. It’s an action verb not a noun. The paradox of this kind of love is how much happiness and peace we personally receive from it. The more we give of ourselves to the other, the more we receive. Reflecting on “we are made by love, for love, to love”, helps explain this paradox, as we’re being true to our design and purpose. Trust is a natural and logical extension, of our identity in God. If God created each of us in His image, to be with Him, to love Him and be loved by Him — why wouldn’t we put our full and unconditional trust in Him? Sin clouds our judgment and actions. We’re falsely led to believe that we are the center of all and that serving our own distorted appetites will bring us happiness and peace. Reflect on this; what brings you lasting happiness and peace? 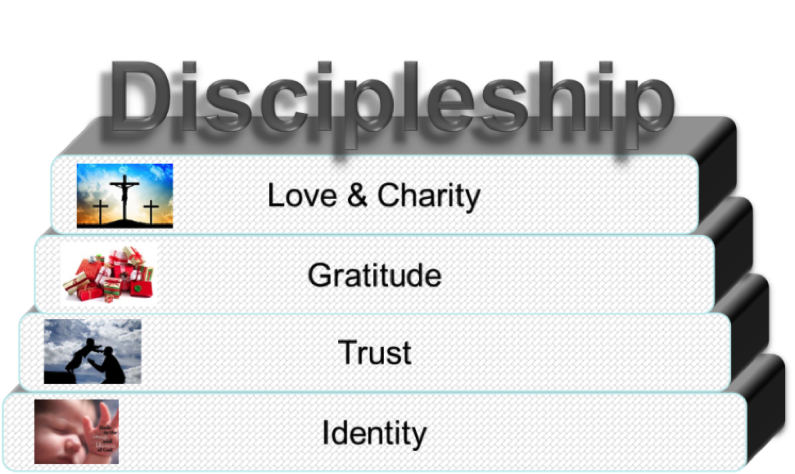 But, what does Identity and Trust have to so with Discipleship? Discipleship is how each of us answers Christ’s call to follow Him and to evangelize the world. It is how we personally bring Christ into our lives, and the lives of those around us, each and every day. Until we are able to accept the fact that we’re made in His likeness and image and He is therefore deserving of our unwavering trust; we cannot expect to be disciples. The call to discipleship requires a counter-cultural response that makes no logical sense UNLESS we embrace these beliefs. Once accepted, they feel right in the depths of our hearts and we find happiness and peace that is so hard to find in our crazy world. So, knowing that we are made in God’s image and likeness (our Identity) and that we are loved by God allows us to place our lives in His hands (our Trust). From this trust we come to understand that God’s plan is all good and that He will provide for us. This revelation is liberating. He will provide. We’re not in this alone. It allows us to detach ourselves from the blinding pursuit of earthly goods and see them for what they are: gifts from a loving Father. We simply accept these gifts with Gratitude, be good stewards of the gifts and return them to Him with growth. We know that Love is a requirement of being a Christian. It’s the action verb in the greatest commandments given by Christ. We cannot be called disciples if we don’t love. Love is used interchangeably in scriptures and in our faith tradition with charity (as an example: faith, hope and love or faith, hope and charity). Love or charity requires one to give to the other. This isn’t all that hard when we realize, in gratitude, that all we have comes from God and that He will provide. Let’s tie these beliefs back to discipleship: Discipleship is how each of us answers Christ’s call to follow Him and to evangelize the world. It requires us to receive His gifts in gratitude and use them for the benefit of His Kingdom on earth. Discipleship is how we love Him, and our neighbor, each and every day. Like so many things in our Church, this is both a communal and a personal calling. It’s communal in that we’re not called to do this all on our own. We’re called to live in community and to minister within that community (family, small Christian communities, parish and Diocese). But we can’t serve those communities without making a personal and intentional decision to strive to live by Christ’s example and to follow our heavenly Father’s will. We are called to return the Father’s love and gifts for us to our neighbor and fellow man. If we embrace these beliefs and live them in our lives, we have to be improving our chances of hearing the Father say “Well done my good and faithful servant”.